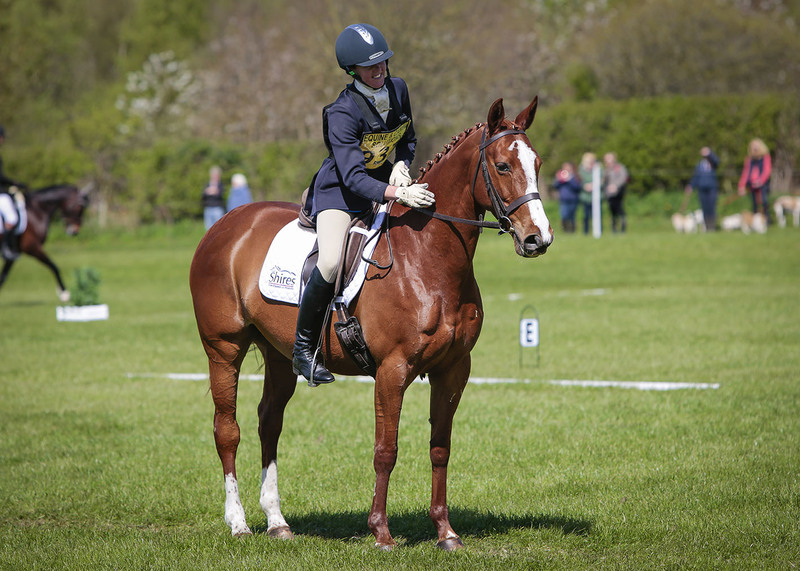 Equerry Horse Feeds Senior Nutritionist, Louise Jones provides advice on what to feed if your horse gets anxious in the dressage arena. 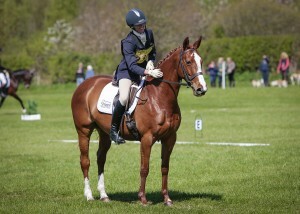 Q: My horse is very talented in the dressage arena but can get anxious at times. Can you suggest a feed that will maintain his condition but assist with keeping him calm – Karen Hicks. Even the most talented horse can suffer from anxiety, especially at competitions. This can manifest itself in a number of different ways including, over-excitability, resistance to aids, apprehensive or fearful behaviour. An anxious horse will not perform to the best of his ability and this can make all the difference in competitions where every score counts. Anxiety can also contribute to loss of condition, reduce digestive efficiency and increase the risk of digestive disturbances. There are many reasons why your horse could be nervous or stressed, but whatever the source of his anxiety his diet will play an important role in helping him to remain calm and composed during competitions. Feeding cereals, which are high in starch, has been shown to increase spontaneous activity and reactivity to stimuli in horses. Starch is broken down in the small intestine into simple sugar (glucose), which is then absorbed into the blood to be used as a source of energy. It is thought that this fluctuation in the blood sugar levels may be the cause of behaviour changes in some horses. Therefore, horses prone to anxiety will benefit from a diet that is low in starch and sugar. However, this isn’t always easy to achieve as many conditioning feeds contain starch-rich cereals such as barley and/or maize. 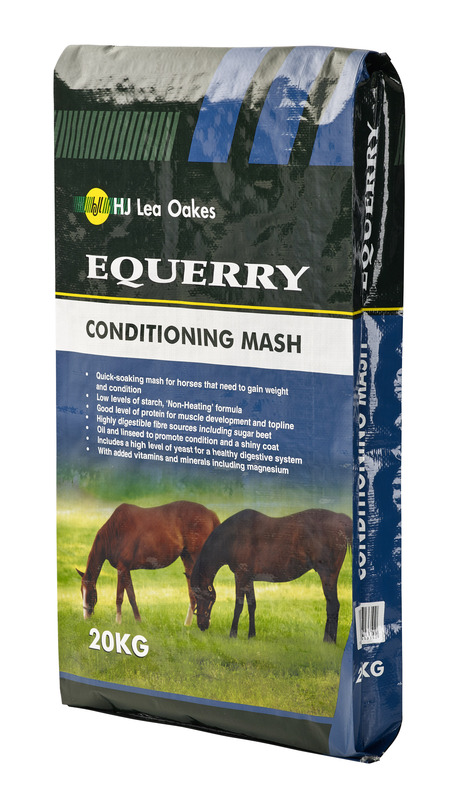 As your horse needs to remain calm, but also gain condition, Equerry Conditioning Mash is an ideal feed. This is a low starch (12%), quick-soaking mash, specifically formulated for horses that need to gain weight and condition. It will ensure your horse receives ‘Non-Heating’ calories from highly digestible fibre sources and good levels of quality protein to support muscle development and topline, as well as aiding recovery post-exercise. Equerry Conditioning Mash also contains very high levels of yeast to help support your horse’s hind-gut health. This is particularly beneficial as anxious horses are often more prone to digestive problems such as loose droppings and/ or colic. Equerry Conditioning Mash also contains added vitamins and minerals, including magnesium and B-vitamins, which help to support normal nerve and muscle function leading to a less anxious more relaxed horse. In addition to ad lib forage, a 500kg horse will need 2.5-3kg of Equerry Conditioning Mash daily, which should be divided into at least two feeds. 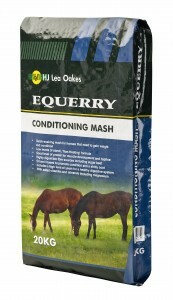 Equerry Conditioning Mash should be soaked for at least 5-10 minutes prior to feeding with equal parts water to cubes. Transforming a nervous horse requires correct management, training and nutritional support, as well as time and patience. However, working to reduce your talented horse’s anxiety will be beneficial and you should soon find that his already good dressage scores improve even further. Whatever your feeding questions call the Equerry Feedline on 01845 565640 for practical, friendly advice.